This recipe takes more time than my usual dishes, so you can keep it for a w-e when you have a few hours to spare :) I just came back from Damascus, where I visited my granny Megdo.. This post is for her..
Megdo is famous in Damascus for being an incredible cook.. And believe me that when you're renowned for being an amazing cook in Syria, it really means something! I remember that she always looked so classy in the kitchen, wearing the most elegant outfits, high heels and making everything look so simple while chopping, stirring and cooking.. Today my mother and aunt are great cooks due to Megdo, and I hope I have a little something of her’s too.. 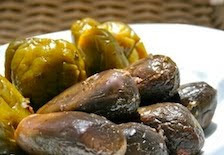 This is Megdo’s Yalanji recipe (stuffed vegetables), a classic Syrian dish.. In a large pot that fits all ingredients heat some sunflower oil and cook the onions, then add garlic, tomato, parsley, mint, salt & pepper to taste.. Add the rice & molasses and cook for a few minutes then transfer to a bowl and cool the mixture down.. Add the olive oil, knead everything with your hands and set aside..
Cut the heads of the peppers & eggplants and remove the insides.. Be careful not to pierce the skin.. Now gently stuff the veggies with the filling and place in the pot.. Use a chunk of the filling to seal the stuffed eggplants.. Fill with water (covering veggies x2 as they will absorb a lot), add the sunflower oil & lemon juice, bring to a boil and reduce heat to low.. Rest a plate on top of the veggies as a lid, and place something heavy to keep everything in place, then gently cook until veggies are soft (about 2 hours), adding more water if necessary.. Once they are ready, let it cool for an hour then gently remove the peppers & eggplants, and serve warm or cold.. Sahten! Megdo’s famous Yalanji..